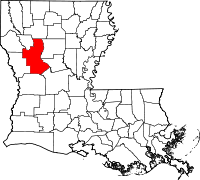 Natchitoches Parish, one of the original twelve parishes that were formed in 1805 when the Territory of Orleans was broken up, relies on its Clerk of Court, as well as an Online Index System to keep track of its vital records. For specific requests with regards to genealogy, those interested can contact the Genealogy Office, which is located in the Old Natchitoches Parish Courthouse; their phone number is (318) 357-2235, and they are open from 9:00AM until 4:00PM on weekdays. The Clerk of Court is located in Natchitoches, LA, and the main phone number is (318) 352-8152. Marriage records via the Clerk of Courts are available from the mid 1700s to the present, and birth certificates are available from 1983 to the present and birth cards from the early 1900s. Natchitoches Parish was named for the Natchitoches tribe of Native Americans who resided in the area.